A most appreciative hello and welcome back to The Closet Concert Arena fellow progheads! The carousel we call 2019 is moving so fast I can't believe I haven't fallen off--or at least gotten dizzy! 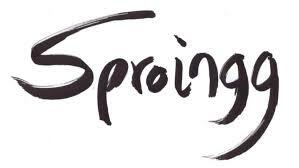 As usual the Concert Closet logged serious frequent flyer miles this week as the search for all things prog went all the way to Germany to check in with yet one more new member of the prog garden, Sproingg, and their self-titled debut release. avant-garde, and a bit of funk. The opening cut, "Sugarwax Nailface," starts off seemingly as an improv piece; everyone checking the others' vibe--and then a groove catches fire. Almost like an undisciplined King Crimson with top notes of Happy Graveyard Orchestra and Dreadnaught, the music comes at you from several directions, bouncing through your cerebrum like a pinball. 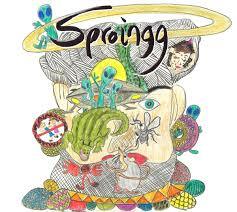 Take in the full Sproingg experience at their Facebook page and purchase the music at Sproingg. So my fellow progheads I hope you enjoyed this week's installment. On the one hand Sproingg is not your dad's prog band--but on the other hand they absolutely spot on are. As new bands continue to emerge in the prog garden it is refreshing to know they can draw on the standard bearers without being carbon copies. Hell; Sproingg can't produce an exact replica of their own sound let alone someone else's. And therein lies the beauty of prog; the ability to grow your own sound and style continually and not be boxed in. Welcome back to The Closet Concert Arena fellow progheads! Now that we are in full spring mode the search for all things prog is taking on a travel mindset. 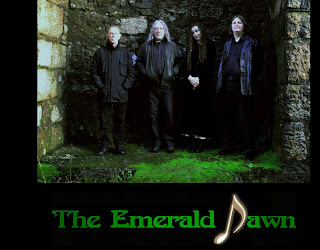 This week the journey takes me back to the UK to check in with The Emerald Dawn and their latest release, "Nocturne." This is album number three for the group, a symphonic prog band that blends classical, jazz, rock, and just a hint of metal to produce something quite unique in their section of the prog garden. Dropping laser to disc, my first taste of this buffet is a song called "As Darkness Falls." The headphones are immediately filled with a heavy brooding as the canvas is streaked with dark hues. The Emerald Dawn is lavish like Dream Theater, eloquent like Gentle Giant, and multi-faceted like The Strawbs. Their sound washes over you like high tide at a surf competition; knocking you down one minute and lifting you back up the next. The intensity of the keyboards on this cut is much like stumbling across a bear while out hiking; the immediate adrenaline rush carries you away until things settle a bit and you allow the experience to replay inside your mind. A haunting piano opens "Moonlight," the second course served up here. The Emerald Dawn has a way of getting not just under, but inside your skin and permeating your entire body. The music begins by waltzing across my mind and slowly running down the inside of my neck, ultimately carrying to every part of my being. The guitar picks up and rides a wave with the drums...and I am mesmerized. Liner Notes...although originally formed in Edinburgh,Scotland, The Emerald Dawn has since taken up residence in St. Ives Cornwall in the southwest of England. The band consists of Tree Stewart on keyboards, flute, acoustic guitar, and vocals; Ally Carter on electric and acoustic guitar, guitar synthesizer, tenor and soprano sax, keyboards, and vocals; David Greenaway on fretless and fretted bass guitar; and Tom Jackson on drums and percussion. 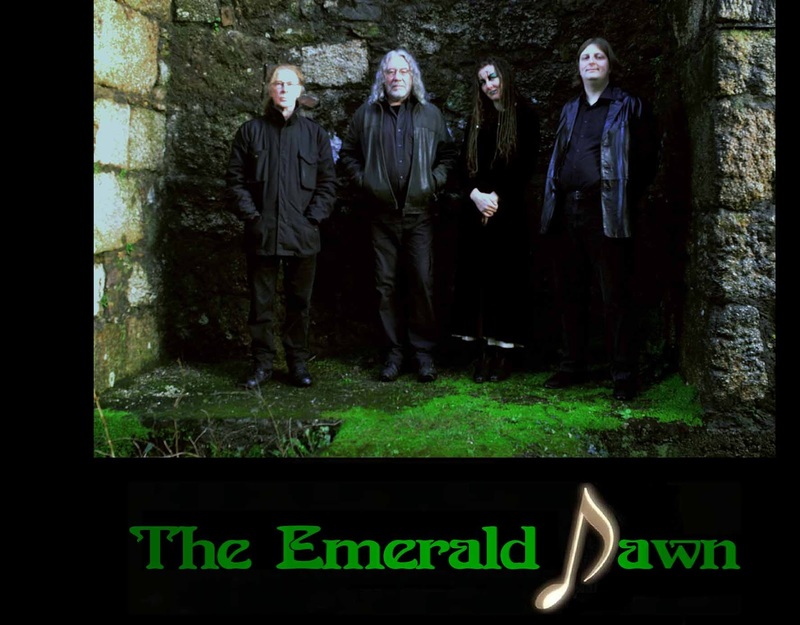 Learn more about The Emerald Dawn and purchase their music at The Emerald Dawn. You can purchase "Nocturne" as well as their two previous albums and find out more about the band. There is also Facebook for the modern day groupie as well as Twitter @TheEmeraldDawn1. You will also find the band at bandcamp if you prefer to purchase downloads there. The options are plentiful and its been awhile since I preached, but please support the artists! One more slice of dark tranquility, "The Child Within." This is a stunning work; just sit still and let it wash over you a few times. The song opens with all the hoopla of a David Lynch movie; anticipation building on intensity. There are top notes of Genesis and Uriah Heep floating through the room and Tree's vocals are reminiscent of Nico when she recorded with The Velvet Underground. This is the cut that puts the "progressive" in progressive rock for The Emerald Dawn; there is so much happening on the periphery you almost get swallowed by the enormity of the production...and there's no shame in that. And here is the point where I usually post a song to tempt you to open your wallet as well as your auditory sensors, but no ear candy this week. You'll have to buy the album to get the music and you really should. The Emerald Dawn has put together a beautiful record; "Nocturne" is a stroll through the symphonic section of the prog garden and the imagery is striking. This album takes me back to when progressive rock was filled with "those bands," groups that paid attention with their hearts and souls; writing, performing, and producing music they believed in and letting the listener decide. So many musicians today seem like they signed up for a job--not these folks. The Emerald Dawn is in it for the long haul which is perfectly fine by me...The Closet Concert Arena always has time (and space) for another stellar performance! 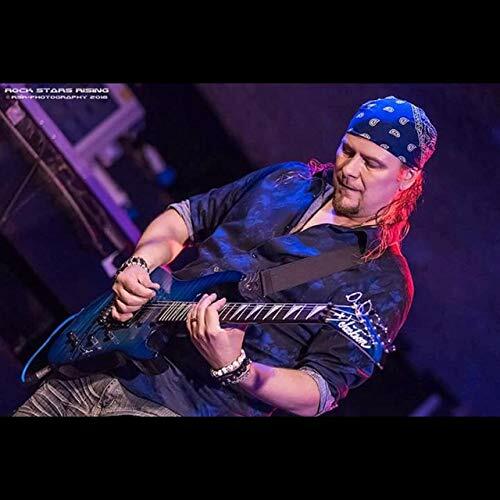 The Steve Bonino Project "Stargazer 2"
Steve Bonino is a multi-talented multi-instrumentalist who released his latest album, "Stargazer 2" under the guise of The Steve Bonino Project. A concept album dealing with a dystopian future where man has failed to care for the planet to the point Earth is no longer inhabitable, "Stargazer 2" is a bit dark perhaps, but when the curtain is pulled back one never knows what lies on the far side, so hand me that rope, would you? The album opens appropriately enough with "The Grand Finale." Beautiful piano interlude leads you down an alley of uncertainty; the tempo is akin to running in the dark as you dart under spotlights catching you stop-motion like. The song moves quickly and despite opening on the gloomy side of town it manages to cross over to a brightly lit boulevard, careening through a world of mayhem...or is it just a dream? 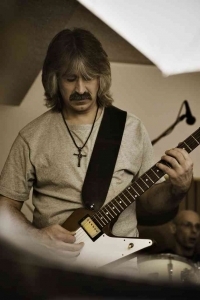 Liner Notes...a native New Yorker currently based in sunny California, Steve Bonino is the driving force behind The Steve Bonino Project, although the album was produced with some very accomplished, well known musicians joining in to add their talents to specific cuts. The who's who runs deep; Peter Matuchniak and Erik Johnson on guitars, Seth Lewis on backing vocals, and a drum corps that includes Mike Lewis, Jimmy Keegan, and Marco Minnemann. I would say a few valedictorians in that class. Heading out on the road Steve is keeping Peter and Jimmy on the team while adding Jonathan Sindelman, Mike Keneally, and Seth Romano. Another stellar group with lots of A-List experience; this tour should be on your summer "must-see" list. Steve has been around the prog garden a few times. Fans will remember he was part of the 2018 breakout band Bomber Goggles and their debut release, "Gyreland." 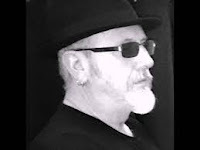 Steve has done extensive solo work, performed with many artists, and was involved with several groups having roots that run deep through the prog garden. 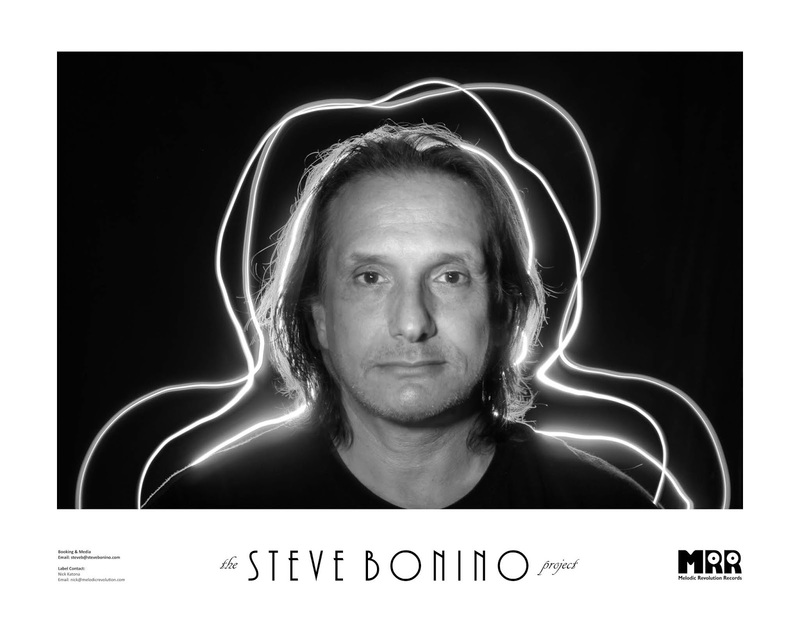 You can learn more about Steve and his pedigree at Steve Bonino. There you will find links to this album and all of his music. You will also find Steve on Facebook and Twitter @trippyone. The listening portion of the blog this week is the final cut, "Fear." Just as everything seems to be fading from sight this tune opens at high anxiety level; you're being trailed by an unknown evil you know is there but can't see. The strings start to pull at your nerves while they seep into your consciousness..and the tension builds steadily. The Steve Bonino Project comes full circle on the concept with this cut; the idea that man as a species mucks up everything he touches only to attempt half-hearted justification for all the wrongdoing. The question of what to do next is always open-ended and while the song breaks through the veil in your mind separating logic from emotion, it leaves you with a sense of uncertainty--and isn't that the point? 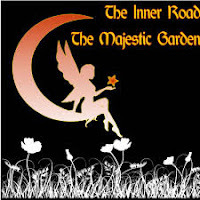 The Inner Road "The Majestic Garden"
The Inner Road is but one project spearheaded by Steve Gresswell and "The Majestic Garden" is the band's fourth release; two years in the making and released just two weeks ago. The Inner Road tends to fill the halls of the Concert Closet with a rich full sound, so let's get right to it, shall we? Leading the way this week is the album's title cut and it opens with quite a ruckus...as is the trail Steve usually traverses. Keyboards take center stage as the headphones erupt with a cacophony of boisterous sound. Extremely upbeat, the canvas is streaked with bright colors akin to a confetti cannon on New Year's Eve. The Inner Road travels around the prog garden yet tends to call the symphonic section home. There are aromatics of Emerson, Lake & Palmer wafting in the air along with a splash of Camel. 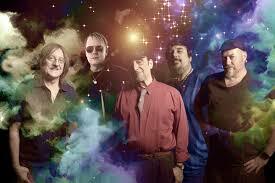 Learn more about The Inner Road and find all their music at their Bandcamp site The Inner Road. There is also Facebook and Twitter @innerroad for those looking for a peak behind the curtain. Moving the laser farther along the CD I discover "All Open Eyes" and once again Kinetic Element bursts through the gate with gusto. 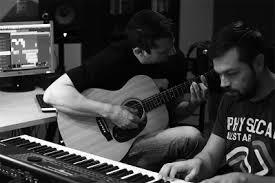 Keyboards and guitars lead you down a brightly lit path toward musical bliss. There are aromatics of Gentle Giant and Camel wafting across the room and swirling about your cranium, the music a siren luring you across the prog garden. Much like the Genesis masterpiece " Supper's Ready," this song goes through time, tempo, and mood changes the way Pete Townsend goes through guitars. Kinetic Element shows off their ability to be ornate without being pretentious; the headphones burst with energy as the music flows through your entire being. 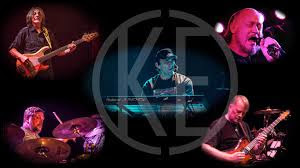 Kinetic Element came into existence in 2006 to perform Mike Visaggio's solo work "Starship Universe" at the Pop Montreal festival that year. 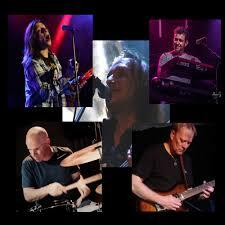 The band signed to Melodic Revolution Records in 2013 and continued their upward trajectory. Many miles, festivals, headliners, and a few line-up changes since that time led to "The Face of Light," the third album in their catalog. 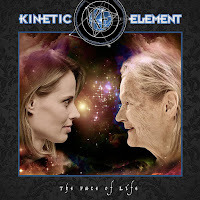 Facebook page and Twitter @kineticelement. My quest for something new meant setting the GPS for the unknown...which took the search for all things prog to Greece this week, a place I have not visited nearly enough. They say curiosity killed the cat; I say the cat should have been a prog fan; he would have had a much happier life! Welcome to the sounds of Residuos Mentales. One last peek behind the mask reveals "A Prospect of a Blooming Life," another beautiful piece that shines a bit of light on the entire collection. The piano once again basks in the spotlight but with more tender overtones and an acoustic counterpart that caresses your mind as it flows smoothly through the headphones and right through your entire being. Residuos Mentales has taken up residence in a unique section of the prog garden; blending the beauty of original Greek music with a "quiet ornate" flair and a touch of ambient, much the way Eno was a soothing balm in his earlier days. The canvas is flush with bright colors more reminiscent of a summer's day than a Peter Max painting; soothing for the mind and spirit--not a jolt of caffeine. 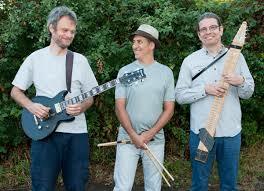 Find out more about Residuos Mentales at the band's Facebook page. There are several options for purchasing the music; bandcamp, iTunes, and Amazon are great places to start. 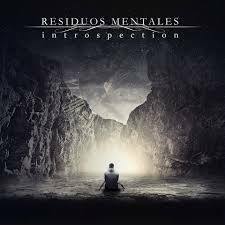 Residuos Mentales play with your senses; a concept album dealing with memories of a tortured past yet there seems to be more serenity than pain in the music...or are they just memories smoothed over with time? "Introspection" toys with you repeatedly, challenging you to forget (or change?) your past. Welcome once again to The Closet Concert Arena fellow progheads! Punxsutawney Phil lied; winter continues its cruel grasp on the globe--at least my section of it. No worries though; we have ways of staying warm here on the tundra, mainly by pumping some good prog through the headphones and sitting by the fire with a warm beverage...yeah, that's more like it. 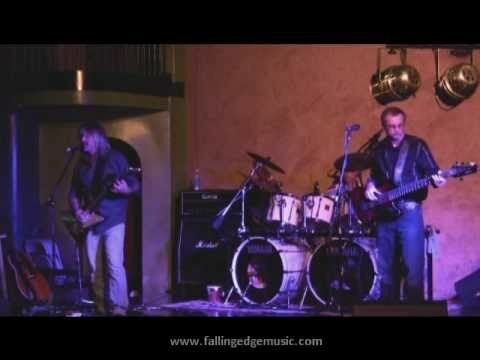 Now that we're all comfortable, let's check out what the search for all things prog led us to this week; a new release from Falling Edge, "FE3." A return visitor to the Concert Closet that releases their music independently, Falling Edge is one of those bands that is hard to pigeon hole; they tend to wander the entire prog garden gathering ideas and inspiration, creating their own unique style. The opening cut "Where Should We Go From Here?" is a quick snippet of the adventure you are about to embark on. The music starts off gently, leading you down a dark alley that awakens your inner fear sensors...and then the door opens to "Experience/Innocence" waiting on the other side, assuring you everything will be fine. A soft acoustic opening leads you on a journey of self exploration. Even with top notes of The Strawbs, Falling Edge remains a band as determined to stand out among the masses as a John Petrucci guitar solo in church. The piece continues to flow through you with delicate ease, keeping the emotional elevator on the ground floor while soothing guitar and gentle vocals reverb through your body. Next up is "Gone," a song that pushes away from the shore Falling Edge has kept steadfastly close to thus far. Don't worry--they don't take you through a metal minefield, but you will discover keyboards that splatter bright colors across the canvas and a guitar that hits you like a taser warning shot. I sense aromatics of Hollow Moon and The Tangent wafting through the headphones as Falling Edge continues on their journey across the prog garden seeking ideas and opportunities to create their unique sound. Liner Notes...Falling Edge hails from Chatham, Ontario and since I have reviewed them several times in the past, I will attempt to avoid redundancy and simply tell you Falling Edge is the brainchild of founder Chris Rupert. "FE3" consists of Chris on vocals, guitar, bass, and keyboards, and Rob Kovar on drums. Many a musician has their name on the Falling Edge alumni list; Chris brings together those he feels can best contribute to the music at hand. 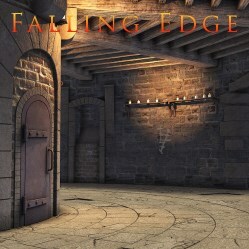 Since their debut in 2004 Falling Edge has released three albums, each an independent slice of their unique style in the prog garden. Chris continues to push and challenge himself musically with each addition to the catalog, and "FE3" is one more step in Falling Edge's journey across the prog soundscape. Falling Edge. You will find links there to purchase all of their music as well as news about the status of album number four. 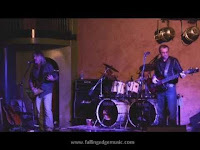 You can also follow along on Facebook and Twitter @FallingEdgeband . Another walk across the calendar has ended as one more week falls into the abyss. Falling Edge once again reminds me of the pleasure that spending time in the prog garden is; so much to choose from and so many tributaries to travel up, down, over, and through. Complacency has no home for the prog minded here in the Concert Closet as a determination to bring something new usually leads to expanded horizons and a wider range of sound and performance.